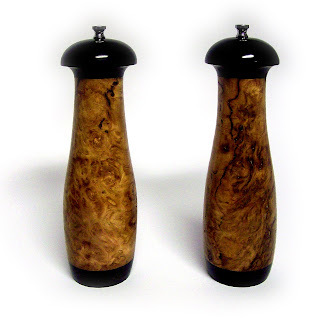 These Salt and Pepper mills are made from premium mill parts with a lifetime guarantee. The salt grinder uses a ceramic grinder mechanism to avoid corrosion. The pepper grinder uses a carbide mechanism designed for uniform size of ground pepper. Both are adjustable from coarse to fine. If you haven't had freshly ground pepper, you don't know what you're missing - the aroma, the taste, makes regular ground pepper seem like such a waste. The top set is 9 inches tall. The bottom is set is 10 inches tall. A similar design, with similar woods, can be ordered for around $225.00, or $125 plus the cost of the materials.